As the keynote speaker of the Brigance Colloquy, Dr. Denise Bostdorff lectured about the values of public speaking Thursday night in her address "Citizens Speaking: Rhetorical Education and Civic Engagement." 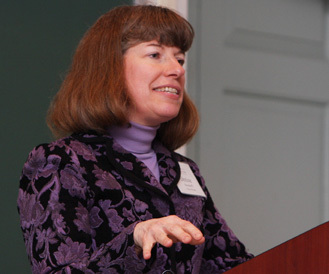 Bostdorff, who received her Ph.D. in political rhetoric from Purdue University and is currently Professor of Communication and the Associate Dean of Students at the College of Wooster, gave her own unique take on the Colloquy’s annual theme of "Public Speaking as a Liberal Art." Bostdorff's keynote kicked off the colloquy, which included discussions all day Friday. See pictures here. After a brief introduction by rhetoric professor David Timmerman, who was a graduate student under Bostdorff at Purdue, Bostdorff began the lecture by showing her strong support for rhetoric in the liberal arts. "I decided stop teaching graduate school at Purdue in order to teach at Wooster because I loved teaching undergrads who I knew would go on to become physicians, lawyers, or businessmen, but would be able to apply the rhetoric techniques that I had taught them in whatever profession they entered," she explained. Bostdorff then progressed through the history of rhetoric development as a subject, focusing on key developers of the subject, such as Socrates, and even former Wabash rhetoric professor Norwood Brigance himself. As her speech reached more contemporary times, Bostdorff illustrated it had become commonplace for colleges and universities to downplay the importance of rhetoric as a vital component of education. She even cited one rhetoric textbook that claimed that the only two reasons to learn rhetoric were for "empowerment and employment." Bostdorff also marveled at the different treatment received by different methods of communication. "Speech is a skill that is assumed at many colleges. They will have mandatory classes teaching students how to write, but with speaking, they just figure that you’ll catch on with time," she said. Citing media evidence such as the book Bowling Alone, Bostdorff explained that today, people simply lack the civic engagement and community involvement that they have had in the past. While Bostdorff acknowledged people under 30 have shown signs of increased community service as well as steadily rising voter turnout, she also mentioned that there is a significant gap in knowledge in this same generation. Despite their high level of activity, she stated, they are still more likely to read Maxim and Cosmo than Newsweek and Time. She illustrated the lack of awareness with a particularly amusing anecdote. "In one of my classes, I had my students write letters to the editor. When I gave them the option to send the letters, I had a few students who were shocked to hear that they had to sign their name to the letters. They said, ‘Can’t we just write "anonymous student," at the bottom?’"
She also mentioned that students are increasingly taught just to defend and attack rather than deliberate. "Often these days, the opponents are seen as dragons that need to be slain," she said. Ultimately, though, Bostdorff expressed great faith in what she called the "Millenium Generation," or those born between 1978 and 1996. "This generation is less cynical about politics" as well as "More diverse and open to social issues." Bostdorff ended her lecture with three ways to place rhetoric back in the forefront of education and improve civic engagement. The first idea was to "make the classroom a forum for civic engagement." Bostdorff said that would help to foster "sense of community and sharing" among the class as well as "give students an opportunity to learn and make mistakes." The opportunity, she said, would also show students that issues are "competitive as well as cooperative." "We need to think more critically, not more cynically," she added. Extending beyond the classroom was another way Bostdorff advised that professors could increase the use of rhetoric for civic engagement. She specifically called for faculty to experiment with "service learning," which called for students to engage in class projects in which they analyzed some kind of problem in the community and then actively developed and implemented a solution. Finally, Bostdorff called for faculty to promote undergraduate research, something that she felt would allow students opportunities to develop a thesis, conduct research, and defend an argument. Sam Prellwitz, a junior rhetoric major, found Bostdorff’s speech especially relevant and thought that Wabash could benefit from incorporating some of these ideas into its own classes. "The key is that there needs to be a continued renewal of the idea of speech and speaking in deliberation in classrooms and out of classrooms. A classroom cannot rely on simply writing papers and knowing facts. Students need to be able to do research and use both writing and speaking to get that research across," he said. The Brigance Colloquy has occurred annually since 2005 and is named for former Wabash professor W. Norwood Brigance.